An image like this could only be captured by an observer who’d traveled the 3.2 billion miles to take it beyond the orbit of Pluto! Luckily for us, in July 2015 we had exactly that: the New Horizons spacecraft, which had spent the previous nine and a half years soaring across the Solar System. Here we have a view of Charon, Pluto’s largest moon (and at 750 miles across to Pluto’s 1,474 a co-orbital companion, really) seen sliver-crescent illuminated by the Sun but also with the faint glow of reflected sunlight off Pluto — Plutoshine — brightening its night side. Similar reflected light (i.e., Earthshine) is what allows us to dimly see the night side of our Moon during crescent phases, sometimes poetically referred to as “the old Moon in the new Moon’s arms.” It was first accurately described by Leonardo da Vinci 500 years ago, who realized correctly that the light striking the Moon’s dark side* was coming from Earth. Read more here. 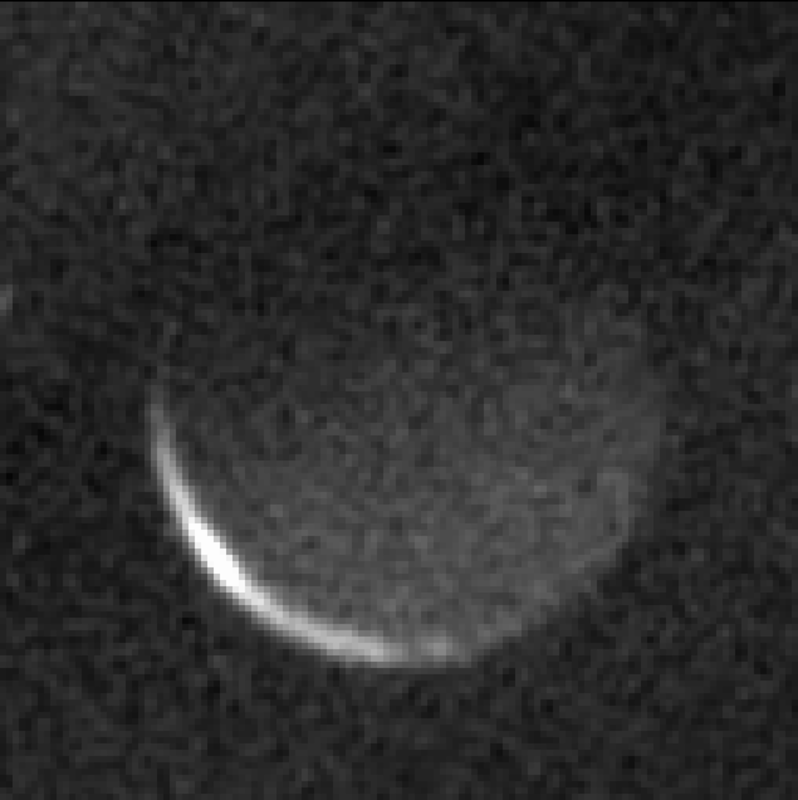 The image above is a combination of 16 one-second exposures was taken by New Horizons’ Long Range Reconnaissance Imager (LORRI) at 02:30 UTC on July 17, 2015 — three days after its closest pass by Pluto. New Horizons was 1.9 million miles (3.1 million km) from Charon when the images were acquired. *If you want to correctly refer to the “dark side of the Moon,” don’t confuse it with the far side of the Moon. The true dark side is wherever it happens to be night — not illuminated by direct sunlight — which is often and regularly visible from Earth, as opposed to the just-as-regularly illuminated far side, which is never visible from Earth.